On Februray 28th 2010, we, @-Bian Custers, gathered together with the yearning of the heart. "2-28 Day" is a memorial holiday to commemorate the selfless dedication of 228 elites. The inspiration of 228 is just as the flowers bloom in the hearts of freedom. It's the cornerstone, founding spirit for the people of Taiwan to build a new, democratic country. 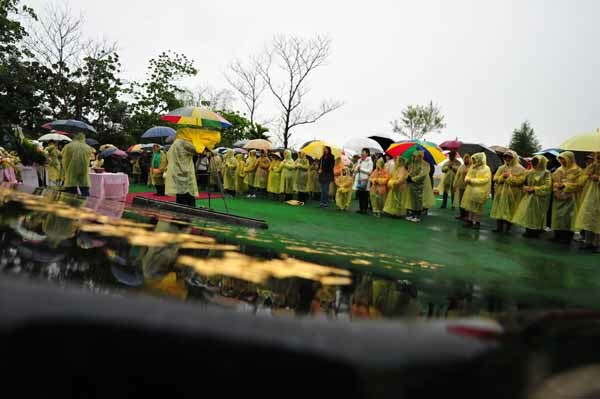 Let us stand before the Holy Mountain 228 monuments on the date of Feb. 28th, commemorate the Taiwanese Divinities, the founding belief. May God and Taiwanese Divinities with you at this moment. 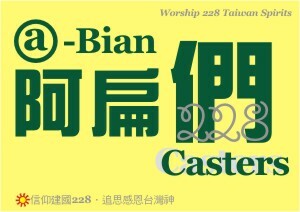 Proud of being called "Bian Casters"
1. Against one China policy, and resist to unify with China. Taiwan and China are two separated independent countries. 2. Advocate the "No Unification with China" referendum and the cohesion of Taiwan's internal unity. Democratic Progressive Party (DPP) Chairman Su Tseng-chang (蘇貞昌) and former DPP chairperson Tsai Ing-wen (蔡英文) yesterday paid tribute to murdered professor Chen Wen-chen (陳文成) to commemorate the 31st anniversary of his passing. The two senior DPP officials posted tributes to Chen on their Facebook pages and highlighted the significance of Chen’s death during the White Terror era to the nation’s democratic development.